Cornish artisan confectioner Buttermilk is launching its newest snack bar – an all butter bar of crumbly caramel sea salt fudge enrobed in Belgian milk chocolate! The new snack bars will be available across the UK, including Waitrose and BP, making them the perfect on-the-go treat. Buttermilk is also delighted to announce that the new bars will be wrapped in a compostable cellulose wrapper so they won’t pollute the environment. They can be placed into a home compost bin and will decompose within weeks. 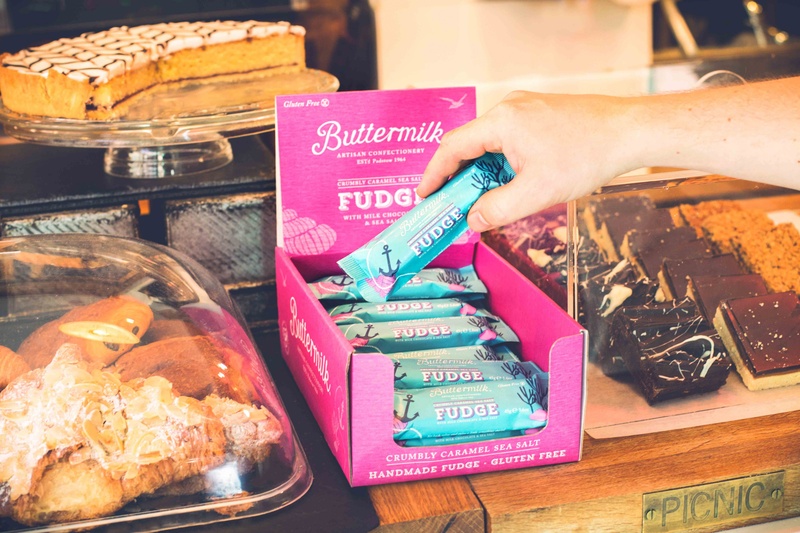 The new bars are a premium addition to the trend for ‘on-the-go’ snacking and join Buttermilk’s line-up of more than 60 flavours which range from clotted cream to Pink Gin. The family-run firm’s award-winning treats are still created using traditional recipes and methods at the company’s production kitchen near Bodmin moor. Buttermilk managing director Tracy McDonnell Goad said: “The crumbly caramel sea salt is one of our best-selling flavours and we are delighted that it is now available in a handy snack bar size in hundreds of locations across the UK.